A prototype of the Nazi Hover Tank, rallying the troops (and occasionally flattening them) in Paris. The Nazi Hover Tank (NHT) was an experimental vehicle created by the Nazi government during the late stages of the Second World War. While having the same functions as a normal tank (shooting projectiles, causing casualties and implanting phobias of metal things into children in war-torn countries), the NHT also doubled as a land based hovercraft, capable of traveling through Terra and whatever the Latin word for sea is. Fortunately, due to budget constraints and time limits, the NHT only ever became a prototype, and was not mass produced. It was one of hundreds of many experimental weapons created by Nazi scientists to defeat the Allied Powers, but was a complete failure as it was only able to hover for 15 minutes before exploding. In fact, the development of the NHT was more detrimental to the war cause than beneficial, shredding hundreds of scientists into pieces when their fashionable black lab coats became caught in the rotating hover blades. One could only guess what would've happened if the Nazi Hover Tanks were deployed in large numbers, or if it could've made any difference in the first place. "Like zis, but floating" - A. Hitler when commissioning the Nazi Hover Tank. Though most plans of SS scientists' experiments were burned (among other things), plans for the NHT survived the war, and we can piece together the history of the weapon's development. In the Russian front, the German military needed a hovering vehicle to float above the vast amount of Russian soldiers that were impeding the Nazi's invasion with their weapons and their corpses. The head of the Nazi Party and ruler of Germany, you know who, officially commissioned the creation of the NHT on January 12st, 1942. At the same time he authorized the creation of the Molotov Neutralizer which failed because could only use the weapon in close proximity of a Molotov cocktail. Because of the German military's focus on other, more pressing and genocidal issues, construction of the first NHT began on February 2rd, 1942, a fairly eventful date since it was the end of a somewhat exhausting affair which both parties later regretted called the Battle of Stalingrad. Construction of the experimental weapon was initially on schedule and problem-free, but development soon slowed due to a lack of materials. For example, the steel needed for the massive rotating blades was scarce, and duct tape reinforced tarpaulin did not prove to be a suitable substitute. The gold and platinum needed for the ten meter-wideWehrmacht insignia was even rarer, and the SS scientists had to do with tin foil and acrylic paint which peeled off easily. Some scientists suggested using existing tanks and attaching a hovering mechanism on the bottom, but this was met with difficulty as all Home Depots in Germany were out of hovering mechanisms. Unfortunately for hover tank enthusiasts everywhere (all two of them) only thirteen NHTs were built successfully, and the development team's decision to use Zyklon B as fuel for the weapon was to be their downfall for the Reich quickly ran out of this fuel source. With the project deadline nearing and the high expectations of the high command weighing upon them, Nazi scientists were forced to improvise. This proved disastrous when, in a demonstration, the duct tape and rope secured fans fell off, forcing the test pilots to abort the vehicle to the chagrin of pro-lifers in the audience. 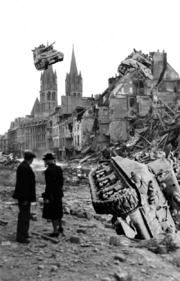 Falling tanks caused extensive structural damage and was the largest cause of civilian casualties in the Battle of Caen. Though the NHT was never mass produced, the few prototypes that didn't immediately explode were deployed into battle as a sort of field test for the weapon. On June 5th, 1945 the NHTs were deployed in the Western Front of the European Theatre in a desperate attempt to stop the allied invasion. Two of the prototypes failed to launch and two headed the wrong direction to Italy. Four of the prototype tanks were able to help reinforce German troops in the Battle Of Caen, but they were eventually shot down by Canadian soldiers. The German military, with most of their assets focused on saving their assets, attempted to use the remaining prototypes to frighten Allied soldiers into surrendering, but this proved counterintuitive. The NHTs were met with much laughter and scorn from the Allied troops. 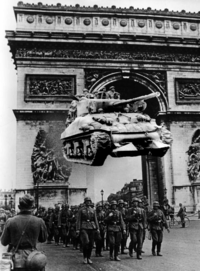 Even though the NHT proved inefficient and prone to failure, Nazi Germany sent the five remaining hover tanks to stop the Allied forces from taking back Paris. To the surprise of everyone completely ignorant of Nazi Germany's recent string of defeats (i.e no one), Paris was liberated, and the hover tanks were finally scrapped and the project cancelled. One NHT that was recovered by the Allies was used to hang the Vive de France signs from the higher buildings of Paris. The ill-fated NHTs were originally intended to be used on the Eastern Front against the Russians, where the fighting was the most intense. The tank's original purpose was rendered mute after the Battle of Stalingrad and the Nazis had to abandon all plans for a swift invasion of Russia. Before the battle, researchers thought they could solve problems inherent in Russian terrain and blitzkrieg: thawing and extreme snow impeded large vehicles, the environment wasn't suited for that type of tactic, and Russia's sheer massiveness. Nazi scientists thought they could overcome these disadvantages by simply hovering above their enemy, while still being close to the ground; because the tanks could hover, they were amphibious and could pass through swamps, lakes, forests, and crumbling city ruins, and the corpses of fallen enemies with greater ease. Nazi Germany, as usual, making it very hard not to treat them like comic book villains. The NHT was designed by the Nazis to, as suggested by the name, hover above ground and be used in all terrains. It was also a tank; in effect, a Nazi Hover Tank. To travel through the vast Russian steppes, the NHT was also designed to be fuel efficient and able to travel thousands of miles in a "recharge"; before the switch to Zyklon B, the scientists designed the vehicle to be used with several hundred, thumb sized batteries. While the NHT was still being conceptualized, different ideas for the hovering mechanism were considered. The most daunting task was inventing a way to levitate twenty-five tons of metal, capable of firing at weapons from thousands of meters away, yet having the maneuverability of a normal Panzer tank. Several concepts for a fuel efficient engine were made, and their ideas would've positively impacted the world by introducing more efficient ways of using fuel if not for the fact it was used to support a fascist, nationalistic military empire with genocidal tendencies. Because the scientist's ideas for the weapon were too revolutionary, they were forced to scale back their goals. Even today, tanks are still unable to hover or float. Though the Nazi Hover Tank certainly looked useful, history proved it an extremely inefficient, and unreliable weapon. If the Nazi scientists were somehow able to improve it in time to make it useful in battle, the tank would not have made much of a difference. As most sensible people know, technology does not win the war, no matter how impressive, hoverable, or fascist. This page was last edited on 18 December 2014, at 14:28.